Peterborough United manager Grant McCann was a proud man after watching his side outplay Championship outfit Aston Villa in the third round of the FA Cup at Villa Park today (January 6). Two goals from Jack Marriott and another from Ryan Tafazolli earned Posh a place in Monday’s (January 8) fourth round draw with a 3-1 win. 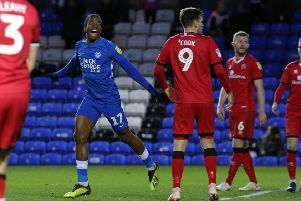 Posh scored three times in the final 15 minutes after reaching half-time a goal down. McCann hailed his players for their all-round excellence against a Villa side who made 10 changes to their starting line-up. “We were outstanding,” McCann purred. “We were brave, we played good football, we created many chances and we have deservedly beaten a very good side. “I know they made 10 changes, but they still had an awful lot of quality in their line-up. “We didn’t start so well, and losing the early goal was obviously disappointing, but we went on to dominate most of the game. Posh manager Grant McCann (right) and Aston Villa boss Steve Bruce before the game. Picture: Joe Dent/theposh.com. “It was harsh for us to be losing at half-time, but we kept believing and we got the rewards we deserved. “We were very brave. The full-backs were brave enough to play high and we were confident in our passing. “Jack Marriott missed a couple of chances in the first half, but he just keeps going and there he was to score two goals and make it 23 for the season. That’s outstanding for this time of the season, but it’s not a day to single anyone out. They all played their part. They were all top drawer. They all played with impressive composure. “It was great to celebrate with the fans after the game, but we don’t have long to enjoy it. “We have another big game in an important competition on Tuesday (January 9). Posh are next in action in the Checkatrade Trophy at Luton Town on Tuesday.